Several students from Chillicothe High School and Grand River Technical School were recognized at the school board meeting on Monday, April 20. CHS students who excelled in athletics and academics were recognized, as well as, GRTS students who performed well in SkillsUSA competitions and who exhibit outstanding work ethic in the classroom. 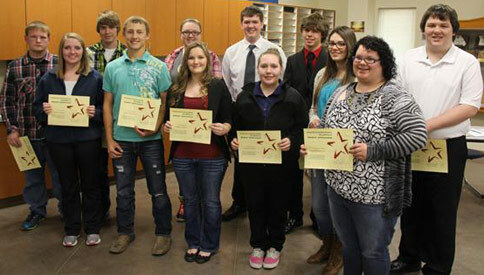 GRTS students, Jeremy Maudlin, Megan Gilliam, Dillon Cook, Brent Campbell, Mandy Ewing, Morgan Clifton, Ridge Maasdam, Jenna Contello, Cody Paris, Emma Griffin, Elizabeth Jarrett and Zach Hacker were recognized at the school board meeting for their commitment to career and technical education, outstanding work ethic, technical skills, academic achievement, attendance and overall leadership abilities. 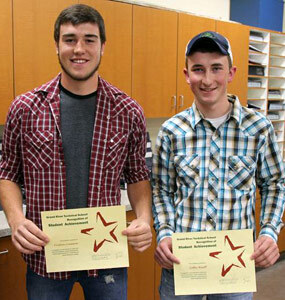 GRTS students, Dylan Branson and Riley Horton were recognized for placing high in the welding competition in State SkillsUSA Competition. 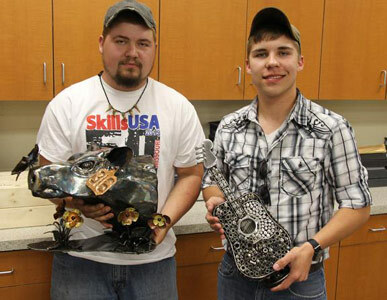 Branson created a cow and received first place, and Horton created a guitar and received third place. Tristan Creason and Colby Ruoff were also recognized for doing well in State Skills USA competition, but in the Manufacturing Division. The CHS athletes recognized at the meeting received all conference / all district honors. Only boys were recognized; girls receiving all conference / all district honors will be recognized at the May school board meeting. For CHS basketball: Nate McKiddy (Jr.), received first team all conference, first team all district MBCA and media all district; Cade Snyder (So. ), received first team all conference, first team all district MBCA and media all district; Mason Hayward (Jr.), received all conference honorable mention, all district honorable mention MBCA and media all district. Coach Tim Cool was Class 3 Coach of the Year. For CHS wrestling: Matt Shaffer (Sr.), was 2015 State Qualifier at 145 pounds and Aaron Baker (Jr.), was a fourth place finisher at 132 pounds. For CHS cross country: Robert Parkey (Jr.), received all conference, all district and was a state qualifier. Noah Holland, CHS senior, was also recognized at the school board meeting. Holland was recognized for his excellence in academics. He was chosen as an honorable mention for the 2015 Missouri Scholars 100, which is a statewide program that honors 100 of Missouri's top academic students in the graduating class of 2015. To be considered for this honor, a student must have a minimum GPA of 3.750; obtain a minimum ACT score of 29 or a minimum SAT score of 1,900; be ranked in the upper 10 percent of the class and has to have taken upper level courses in mathematics, science, English and a foreign language. The student, nominated by his or her school, must also have excellent attendance, be an exemplary school citizen and be involved in the school activity program.